Halloween is a perfect opportunity for online casinos to run special promotions and thrilling offers. One casino that is playing trick or treat with their players is NextCasino. At this casino you will find a Halloween calendar with daily offers that you can claim. The calendar runs the whole week so don't miss to login to NextCasino daily to claim your valuable offers. 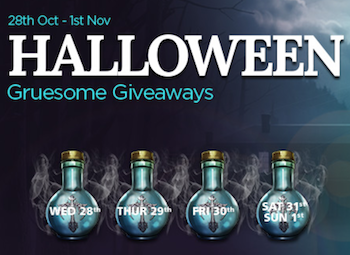 On top of the Halloween calendar NextCasino is giving away €10 free to all members this month. Every day you can login to NextCasino and reveal the daily offer. This Friday there are free spins to claim in the calendar. You can claim 20 free spins on the scary slot Blood Suckers from Netentertainment. To get these free rounds you only have to play 100 spins or more on Blood Suckers during the day. If you do this you will get 20 spins into your account tomorrow after 3 pm. To use them you only have to login to NextCasino and open Blood Suckers in your laptop, tablet or mobile. The free rounds comes with wagering requirements that needs to be met if you want to make a withdrawal. Tomorrow you also have the opportunity to claim a new offer in the calendar at NextCasino. If you make a deposit to the casino during Saturday or Sunday and use the promo code "NCWEEN" you will get a nice reload bonus. You will get no less than 50% extra to play with up to €50. Claim your halloween offers at NextCasino! During October there is a special welcome offer to claim at NextCasino. If you sign up during this month you will get €10 free. To get the free bonus you first have to register and then send an email to [email protected] and enter the bonus code "10FREEOCT2015" in the subject line. If you do this €10 will be credited to your new account within 24 hours. Your free bonus can be used on optional slots and table games at NextCasino. For those of you who makes a first deposit to NextCasino there are more bonuses to get. Your first deposit will be matched with a welcome bonus of 100% up to €200. On top of this generous welcome bonus you will also get 100 free spins on popular slots from Netentertainment. The slots that are included in this offer are Jack and the Beanstalk, Starburst and Blood Suckers. You must deposit at least €20 to be able to claim the free rounds and the welcome bonus.